As you know I’m fighting the battle of the bulge, I’ve headed back to Weight Watchers and I’m slowing trying to plug through all the summertime BBQs and get togethers. The Summer is the busiest time of year for me and I often find myself skipping meals, which we all know isn’t the way to shed pounds. I’m always on the look out for quick, healthy and low point ways to throw some lunch or a hearty snack in me. Dun Dun Dun Dah… Maple Leaf® Natural Selections® Protinis to the hunger rescue! These little packages pack a bug hunger punch. We all know that protein is where its at in terms of filling up and feeling fuller, longer. Plus this type of protein snacking can support physical activity and weight management goals by building and repairing muscles and tissues. The best part, they are so delicious and only pack 2-3 Weight Watchers points (flavors with dried fruit are a bit more)!! Also they come in a variety of flavours to please any palette. 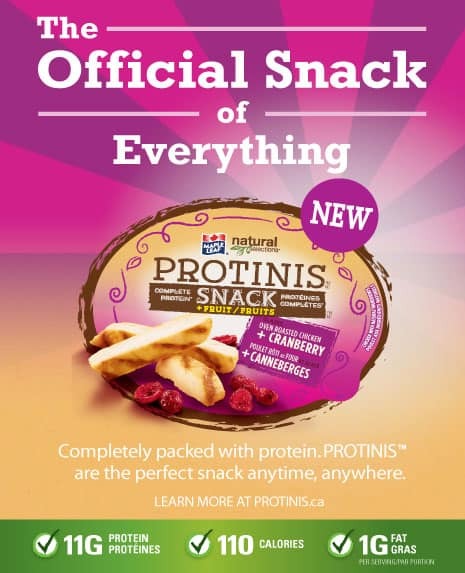 Visit the Maple Leaf Protinis site to learn about all 8 flavours. Although they are perfect for a complete snack, they also make a delicious low point weight watchers meal. Each pack comes with two containers of approximately 15 strips of chicken, drizzled with some really delicious flavours like this one below Sweet Thai Chili. 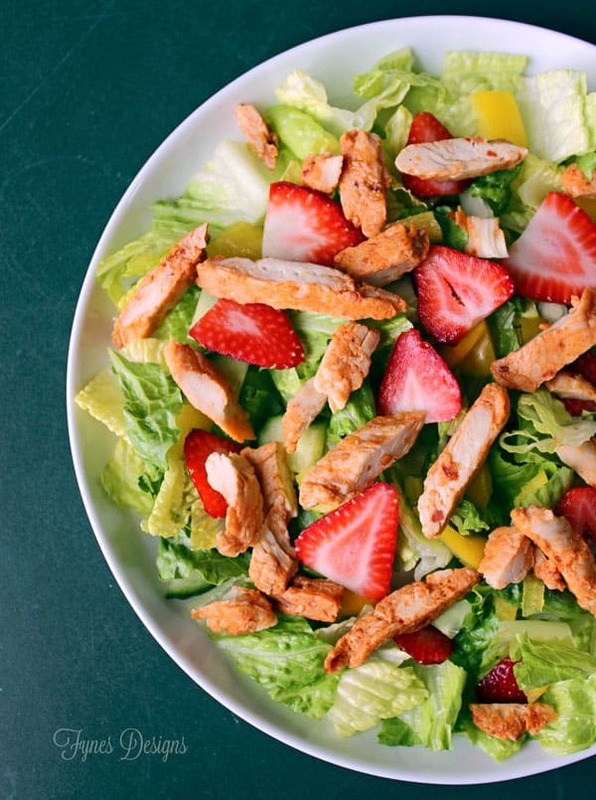 This Strawberry Chicken Salad looks quite delicious for only 2 points, eh?! Or add the Protinis in a pita wrap for 3-4 Weight Watchers points. 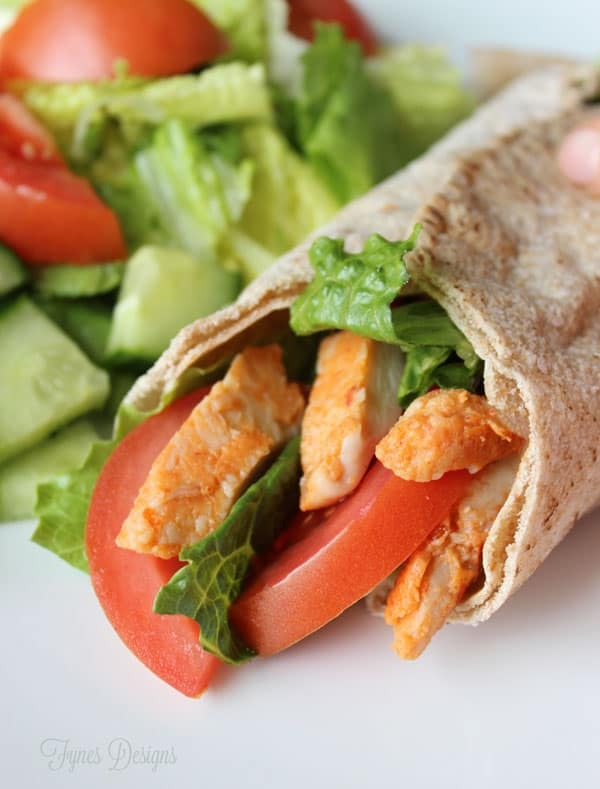 Add a half a pack of Protinis to a pita and top with tomatoes lettuce and low fat Miracle Whip for a 3-4 point wrap. Pair with a salad, and you have a complete meal with the protein needed to stick with you. Want to try Protinis on me? Join me on Facebook for a chance to WIN 5 packages of Maple Leaf® Natural Selections® #PROTINIS valued at $25. What a quick meal, and with low calories! Thanks! Great idea! I love that they’re perfectly portable as snacks but great for dinner too! That salad looks delicious! Isn’t weight watchers the BEST diet! I did WW for one year after college (had to shed that freshman 15… errr 20)! 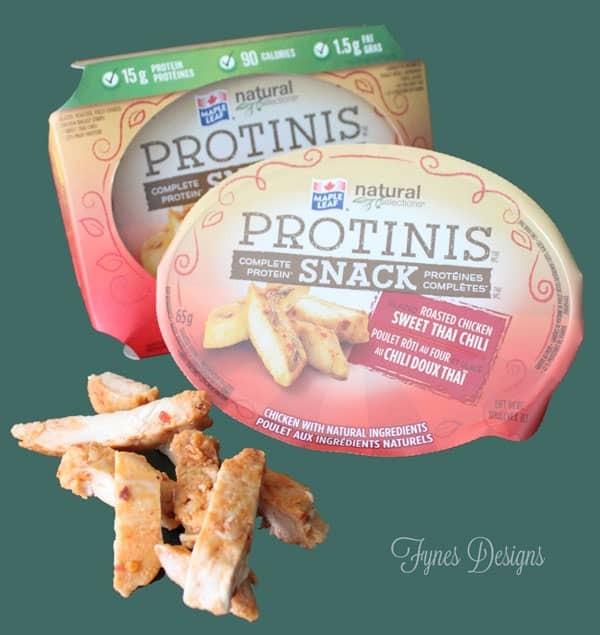 It’s great to hear that Protinis are only 2-3 points – just enough to fill you up as a snack or to make into a meal! Yum! That salad looks amazing. I love strawberries with chicken! Those actually look really good! That salad especially looks amazing. Good luck doing Weight Watchers; it’s almost time for me to get back on that bandwagon again after having Baby 3!